Here you will find information about all things wild and natural in Queens Park. Just click the links on the left to see pictures and information on each particular subject. Should you have any photographs of any feathered or four-legged visitors to the Park, or any unusual fauna, we would love to feature them. Just let us know through Contact Us. 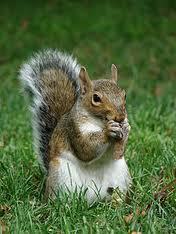 One of our many Grey Squirrels.